Ramadhan began a few days ago and most of my Muslim friends fast for the whole month. Its really not easy, but they all say that as the days go by, the fasting becomes easier. I don’t know how they do it, as I cannot stay without water. I truly respect them for the discipline and resilience they go through. Yes, I have done karva chauth but that’s only for a day. To bring a bit of sweetness into their fasting month, I want to share this yummy recipe. Its very easy to make. It took me hardly 15 minutes or so. Before I left for Nairobi during the weekend, I made paneer from the extra milk. I reckoned that paneer would stay longer in the fridge than the milk. Wanting to blog a sweet dish for my friends, I opened my recipe book looking for a recipe to use up the paneer. 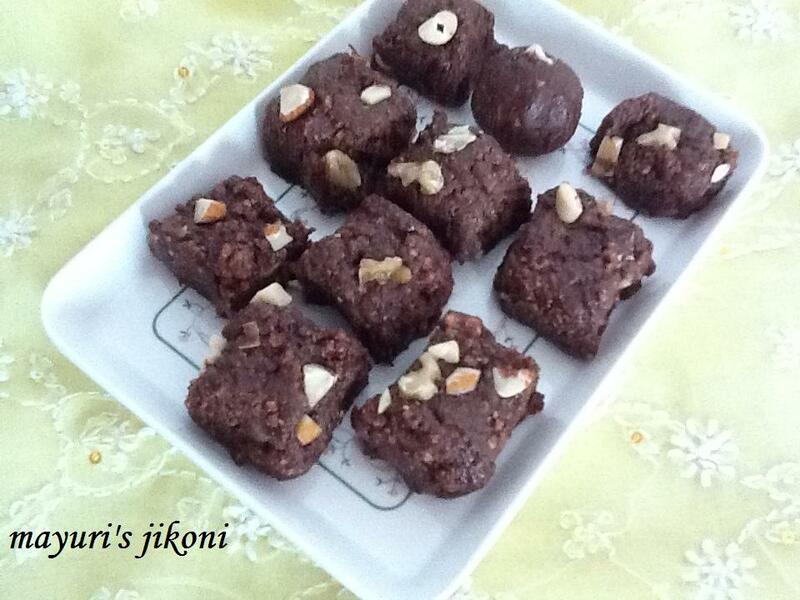 Chocolate kalakand seemed to fit the requirements… easy, can use up the paneer and its sweet and chocolatey. So here is the recipe and surprise you loved ones in the evening with kalakand. To make paneer you simply heat up about 1½ to 2 litres of milk. While the milk is heating up, squeeze a whole lemon (2 tbsp) and keep the juice ready. When the milk begins to boil, add the lemon juice and switch off the heat. Leave the milk for a few minutes. Then heat it up again and stir very gently. The milk will have curdled. Strain the mixture out into a clean muslin or thin cotton cloth. Wash the paneer to remove the lemon taste. Squeeze out the extra water. Put the paneer with the cloth on a thick wad of newspaper. Put something heavy on the paneer like a stone, pressure cooker or you pestle and mortar. Leave it for 5 to 10 minutes. Heat the milk in a non stick pan or a normal pan over medium heat. When it becomes hot add the grated chocolate and stir till the chocolate melts. Add the crumbled paneer, cocoa and sugar. Stir constantly so that the mixture does not stick and get burnt at the bottom. After 10 to 15 minutes, the mixture will begin to come away from the sides of the pan and become a ball and little stiff when you are stirring. Add the chopped nuts and mix. Lightly grease a small tray or steel plate with butter or ghee. Put the mixture into the prepared tray. Lightly grease your fingers and gently pat the mixture into the plate or tray. Let it set at room temperature or in the fridge. If you want to use ready made paneer, wash it thoroughly to remove any acidic residue and grate it. If you have any left over paneer, add chopped tomato, coriander, onion, cucumber etc and use it to make a sandwich. The amount of paneer you will get from 2 litres of milk will depend on how watery the milk is. Add raisins if you like. Lightly toast the nuts before adding them to the kalakand. Store leftover kalakand in the fridge. It just taste really yummy just out of the fridge. Omit cocoa powder if you don’t want it too chocolatey. Make it into round balls if you like. Yummy twist to the regular kalakand. Visit me too.